Child Bereavement UK is delighted to invite you to a very special afternoon at the Hilton Manchester Deansgate on Thursday 10th November from 12pm, where Eamonn Holmes will be hosting ‘A Lunch with Gary Barlow’, who will be discussing his career from song-writing and live performing, to TV and theatre. 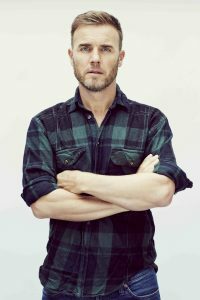 The afternoon will commence with a Champagne drinks reception, followed by a two course lunch in the surroundings of the impressive Deansgate Suite and will culminate with an interview by Eamonn Holmes with Gary Barlow. Guests will then be escorted to different heights at the dramatic, newly refurbished, Cloud 23, for a sumptuous selection of mini desserts, Champagne, tea and coffee. This special lunch will be in aid of Child Bereavement UK, a charity that supports families and educates professionals when a baby or child of any age dies or is dying, or when a child is facing bereavement. Tickets are priced £1,250 for a table of 10 with all proceeds going to Child Bereavement UK. Please let us know as soon as possible to purchase your tickets as they are in high demand. This is an afternoon not to be missed! I really do love writing my Taylor Talks column in The Cheshire Magazine. It’s a great opportunity for me to chat to some inspiring local people and also a range of celebrity friends. 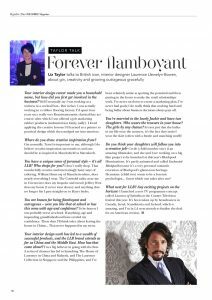 See what Laurence Llewelyn Bowen to say in this July interview for The Cheshire Magazine. He is an amazing character – and a charming, lovely guy.